From the beginning of his reign as emperor in 1826, Nicholas I had arranged a suite of rooms next to his own on the 3rd floor of the Winter Palace for his brother Mikhail Pavlovich. Although married with his home at the Mikhailovsky Palace, the brothers retained a close relationship from their shared traumatic childhood. In the 1880s, Grand Duke Alexei, the fourth son of Alexander II, lived in the former apartment of Mikhail until his own palace was completed in 1886. During the years of Nicholas II, the rooms were used by visiting relatives. 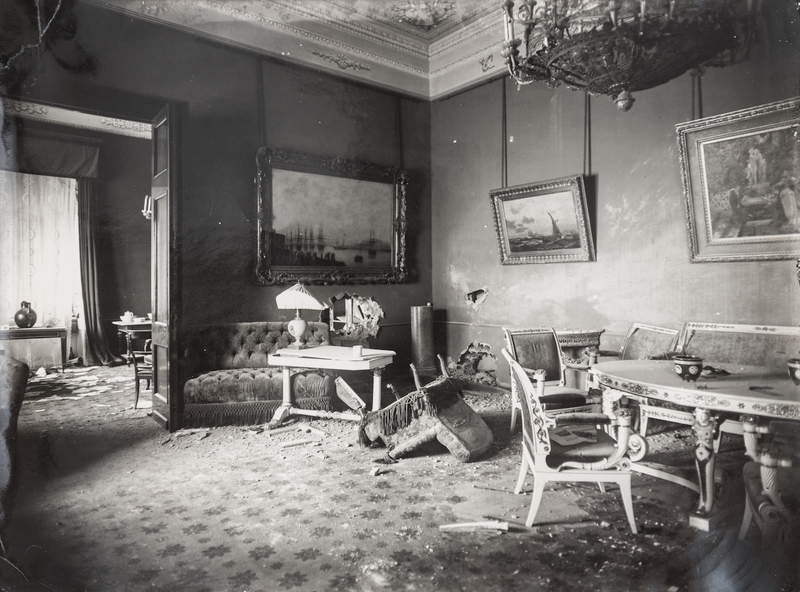 It was taken in November 1917 during the commission’s listing of the damage to the rooms in the palace. The drawing room has two windows facing the Neva River. The door in the photo leads to the former corner study with the window facing the Jordan entrance to the palace. The rooms have been beautifully restored by the Hermitage Museum. Why do the walls have holes, furniture turned upside down, and trash of some kind on the floor? It probably looks that way because as the caption below the photo states, it was taken in November, 1917. After the Bolsheviks had come through and ransacked the Palace. Suspect the vandals were looking for a safe or secret door. The damage is not so severe to suggest an unruly mob but rather insiders who were looking to steal hidden valuables. 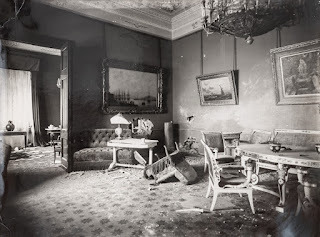 Damage to the Winter Palace in 1917 was minimal to what many believe happened. Palace furniture in most of the rooms used by the provisional government had been taken to storage, replaced by office furniture for example in the former children's apartments on the 1st floor. The above photograph was near the rooms of Kerensky's suite from August 1917.